Berlin, May 2017, 2017: The electroless nickel plating process as used today was first developed more than 60 years ago and has since evolved to meet ever increasing industrial demands. 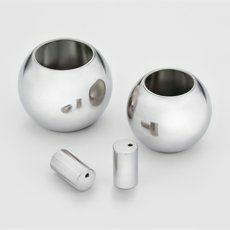 As the name suggests, electroless nickel processes do not require an electrical plating process to form the metal deposit, relying instead upon a chemical deposition using a reducing agent. The ability of electroless nickel to plate uniformly on the whole surface of complex shapes and a wide variety of base materials makes it the coating of choice for applications requiring the highest level of wear resistance, corrosion protection and quality. To complement our electroless nickel portfolio of products, Atotech is proud to introduce the latest development Nichem® HP 1151. Nichem® HP 1151 is a high phosphorus process with excellent bath stability and outstanding pit-free corrosion resistance. The nickel-phosphorous coating is based on patented technology utilizing a unique bath composition. Nichem® HP 1151 was developed to offer a lead and cadmium-free formulation, which fulfills all ELV, RoHS and WEEE specifications, making it suitable for a wide range of applications within the oil & gas, automotive, food, electronic, connector & other industries. The Nichem® HP 1151 deposit contains 10 – 12% w/w phosphorus throughout the bath life, ensuring the maximum resistance to all types of corrosive environments, therefore extending the service life of the critical components in expensive machinery. The long bath life of this high phosphorus process leads to significant cost savings, achieving up to 6 MTO’s on steel and copper alloy substrates resulting in lower operating costs. Nichem® HP 1151 is very tolerant to extreme bath loading, eliminating expensive dummy plating on new make-up. The process is capable of delivering a faster plating rate compared to lead-based processes, producing deposits which pass the nitric acid test throughout the bath life. Nichem® HP 1151 demonstrates high tolerance to metallic contaminants, which extends the bath life. With Nichem® HP 1151, Atotech aims to “raise the bar” for the next generation of Pb-free high phosphorus electroless nickel systems.